Fort Meade in it's 4th championship game in 5 years falls victim to turnovers and poor field possession early in this one, but still manage to keep it close. The Miners Tony Huntley received the opening kickoff only to find himself allowing the ball to be jarred lose by what looked to be the ground, but the officials having a different look, ruled the play a fumble giving the ball to Trinty Christian on the Miner 21 yard line. Three plays later the Concuerors would punch it in from the 4 yard line. The Fort Meade defense did a great job limiting the self proclaimed Machine from Jacksonville to their second lowest point total of the year(17). 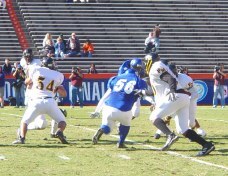 The Miners offense found it hard to move the ball due to the poor field possession dictating play selection. Even with all the negatives against the Miners of Fort Meade, Trinty Christian was only able to put up 10 points in the first half. The second half did not fair much better for Fort Meade as the Miners would fumble their first possession of the second half and allow the Concuerors to score their second touchdown of the night, making the score 17-0 with 5:57 remaining in the 3rd quarter. But the Miners would not give in as seen on their next possession. 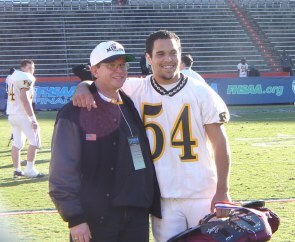 Starting from their own 24 yard line Fort Meade used only 5 plays before quarterback Larry Freeman connected with running back Brian Whitehurst out in the flats for a 64 yard catch and run for the touchdown. 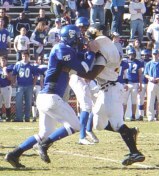 The "Lynch Mob" defense of the miners did what they needed to do to stop Trinty Christian on their next possession. 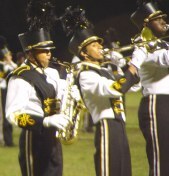 This is when you could feel the momentum start to shift in Fort Meade's favor. 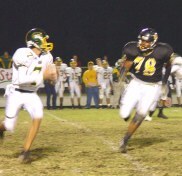 The Miners moved the ball from their own 25 yard line to the Trinty Christian 5 yard line before being pushed back to the 23 yard line and with 4 and goal quarterback Larry Freeman threw to Franklin Brown who was unable to make the catch. 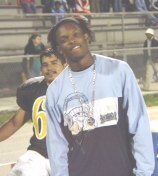 With that, Trinty Christian took over and sealed the game and the Miners fate. The Miner's have a lot to be proud of making it to the state championship game in a year in which was suppose to be a rebuilding year. The Miner fans will always remember this group of young men for the contribution they gave to making Fort Meade Miner football the best 1A PUBLIC SCHOOL program in the state of Florida. Hey Blue, let go of my jersey!!! 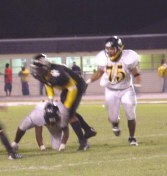 O lineman laying on DB, Imagine that!!! 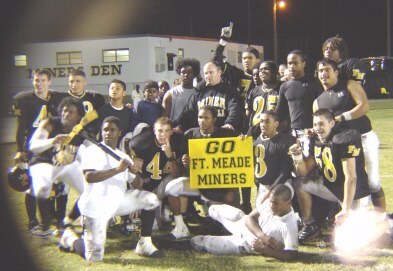 Just one more game and the Miners of Fort Meade can say their mission is complete. 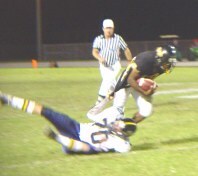 The Miners cruised thru the semi-finals Friday defeating Glades Day School by a score of 36-7. Fort Meade who has out scored their opponents 149-21 used quickness on both sides of the ball stopping the Gators of Belle Glades dead in their tracks. 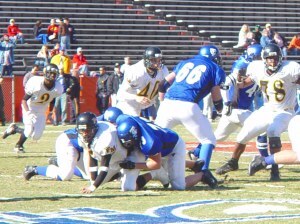 Fort Meade received the opening kickoff and marched 90 yards on 13 plays with Quarterback Larry Freeman taking it in from the 1 yard line. 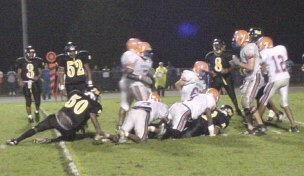 Glades Day fumbled the ball on their first offensive drive, the first of five takeaways on the night for the Miners. 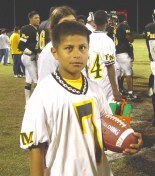 The next offensive points of the night for the Miners would come from a 37yard Field Goal by Flabio Valencia. 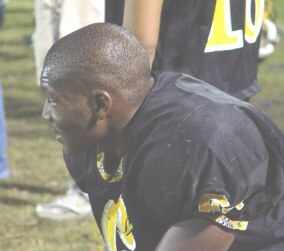 On the Gators next possession the Miners Tony Huntley intercepted the ball to give the Fort Meade offense yet another opportunity to put points on the board. 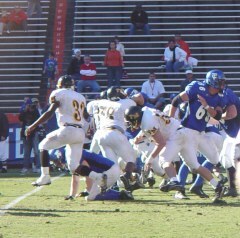 And that is just what the Miners Brian Whitehurst did, running 60 yards for the touchdown. What was so amazing about this play was, Whitehurst after being hit hard enough at the line of scrimmage to take down any normal person, regained his balance and left the gators scratching their heads as he scampered for the score. 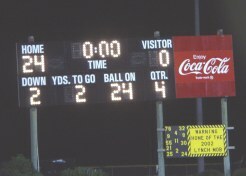 Glades Day was finally able to score their only points of the night with 30 seconds left on the clock in the first half. 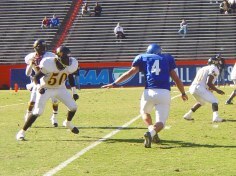 A 3 yard pass to wide out David Shoemaker. 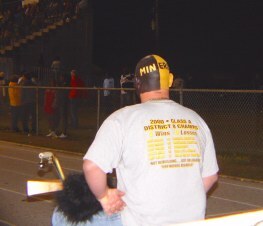 The first 1:30 of the 2nd half is where the Miners sealed the fate of the visitors from down south as Fort Meade kicked off to the Glades Day returner who had the ball stripped by Brian Whitehurst who then ran 30 yards for the Miner score. Then if things were not bad enough 3 plays into the Gators next possession defensive back Andrew Smith intercepted a Glades Day pass and ran 30 yards for another Miner score. This was Smith's second recovery of the evening. 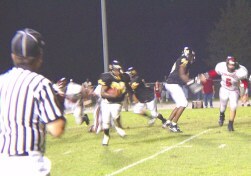 This interception was set up by good pressure from defensive tackle Dakia Howard who recorded 3 sacks in the ball game. 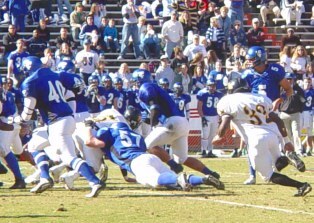 The entire defense which has been told all year that they were to small to be effective played like giants in this game. 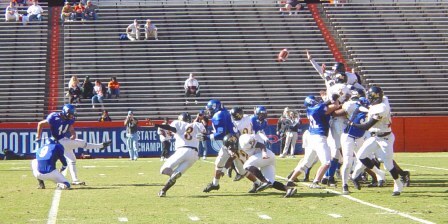 The final points of the ball game came with 10:41 remaining in the game when once again the miners defense stepped up and caused another Gator fumble. Guess who, That's right Brian Whitehurst picked up the ball and ran 32 yards for the touchdown. Your final from Frank S Battlefield ,"Lynch Mob Defense" 20, Fort Meade Offense 16, oh yeh Glades Day 7. 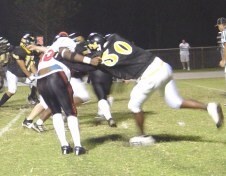 Fort Meade capitalized on Evangel Christian mistakes to cruise to a 40 - 0 shutout. In a contest plagued with penalties the Miners did what was needed to secure the victory and advance to the south region championship to face a familiar foe from Belle Glades. The Chargers tried to use intimidation as a game plan to stop coach Hayde's high powered offense, but found out early on that it's not an easy thing to do when you are facing a team which has played some of the best teams in the state over the last several years. The Miners first half points came as a result of a 1 yard Quarterback sneak by Larry Freeman with 2:04 remaining in the half. 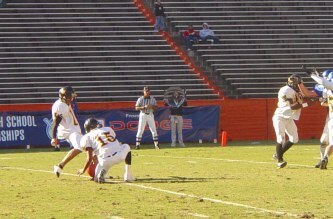 Followed by a 38 yard Flabio Valencia field goal as time expired in the first half. The "Lynch Mob" defense of the Miners held Evangel running back Rod Coby to negative yards in the first half as well as shutting down the Chargers passing game. Fort Meade added to their score in the second half as the Miners used 8 straight running plays capped off by a 1 yard Touchdown run by Wesley Wright. The Miner defense would tackle the Evangel quarterback in the endzone for a safety on their next possession to make the score 19-0. 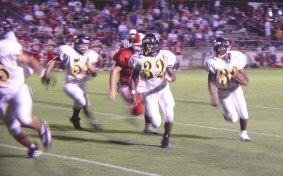 After the free kick from the Chargers the Miners used only 4 plays to strike gold as running back David Barfield scored from 2 yards out. Fort Meade scored 2 more touchdowns in the game, the first a 36 yard burst by the speedster Brian Whitehurst and the second a 37 yard run by backup Roderick Clark. 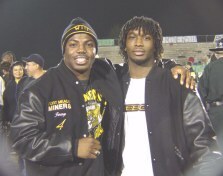 The Miners Tony Price had 2 interception while Freshman Trevan Spears added 1 of his own to seal the deal for the Miners. 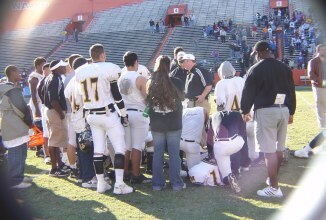 Fort Meade will be at home this week to play Belle Glades Glades Day in the state semi-finals. Good Luck Miners and as always. 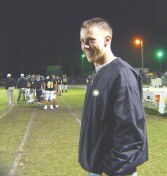 Fort Meade, with it's balanced offense and a punishing defense, advanced to the next round of the FHSAA State Playoffs to host a rematch with Evangel Christian of Lakeland. 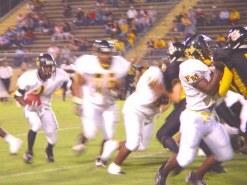 Fort Meade received the opening kickoff and wasted little time scoring the first points of the evening, as quarterback Larry Freeman marched his offense down the field on a 5 play 61 yard drive capped off by a 31 yard strike to receiver Anthony Johnson with 10:23 remaining in the first quarter. After holding Evangelical to a 4 and out on their first possession, the Miners went on a two play 49 yard drive with Freeman running 49 yards out of the shotgun for the Fort Meade score. The Sentinels were finally able to draw within 7 after the Miners opted to try an unsuccessful onside kick. Evangelical Christian used 14 straight running plays finished off by a quarterback keeper around left end to bring the score to 14-7. On the Miners next possession Freeman threw outside to wideout Tony Huntley who in turn threw a long ball to a wide open Franklin Brown who raced to the end zone for the 3rd Miner touchdown. The Lynch Mob Defense led by linebacker David Barfield used it's exceptional speed and hard hits to slow down a stubborn misdirection running attack of the visitors from Fort Myers. 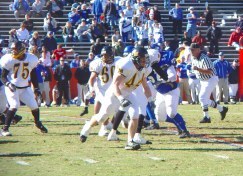 With the defense of the Miners undersized they relied on what got them this far, and that was a swarming style where most of the time there would be at least 6 defenders around the ball. 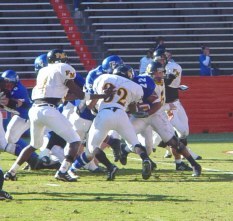 The Miners had 3 scores nullified due to penalties, one of which was a 75 yard interception return by free safety Andrew Smith. Fort Meade retained possession and later scored on a 4 play drive capped off by a 19 yard TD run from David Barfield, one of two touchdowns of the night for the junior tailback. Evangelical Christian's quarterback Calan Lynch would score once more for the Sentinels before the "Lynch Mob" would close the door for good. The final from Frank S Battlefield Fort Meade 49 Evangelical 14. The Miners will be at home Friday night to face District rival Evangel Christian a 31-6 winner over Northside Christian. The winner will go on to play for the South Region Championship. Miner fans need to come out in full force with your noise makers and cheer your home town hero's on to another playoff victory. 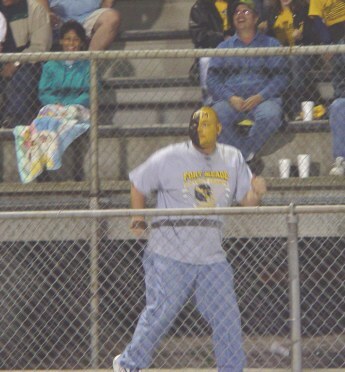 We Need more of these Fans!!! 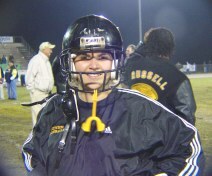 Fort Meade overcame 125 yards of penalties and a limited pass attack to defeat the Bluejackets of Admiral Farragut by a score of 24-0. The Miners opening at home for the first round of the class 1A playoffs used a speed rushing attack and a defense which would not be denied the victory. 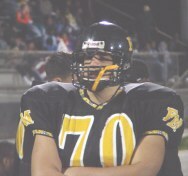 Fort Meade without the services of a few starters scaled back their high octane Offense and kept the ball on the ground using 3 different running backs with just enough passing to keep the defense of the Bluejackets on their heals. 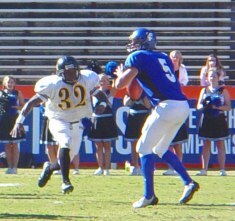 RB David Barfield opened the scoring for the Miners with a 22 yard touchdown run with 3:23 left in the first quarter. 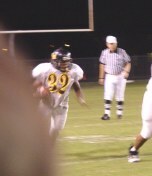 Tailback Brian Whitehurst added 2 more scores in the ball game. 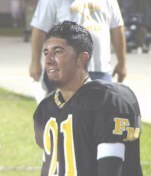 Kicker Flabio Valencia ended all scoring with a 35 yard field goal in the fourth quarter. Super Sophomore Roderick Clark finished off Admiral Farragut rushing 7 times for 91 yards. 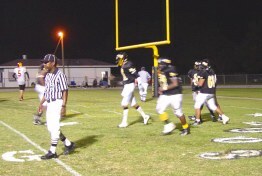 Fort Meade had 3 touchdown nullified due to penalties. 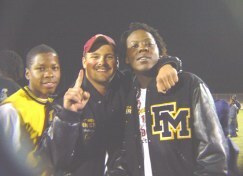 On Defense for the Miners Dakia Howard, Dariel Huddlen and Linebacker Wesley Wright had exceptional games for the "Lynch Mob". The highlight of the night for "The Lynch Mob" was a four down stand from the three yard line capped off with a Wesley Clark interception to seal the game. With the victory Fort Meade advances to the second round to host Evangelical Christian a first round winner over Burkeley Prep 17-10. Fort Meade overwhelmed arch-rival Frostproof by a score of 42-6. The Miners (7-2) used hard running and just enough passing to put the Bulldogs away for a 6th consecutive year. 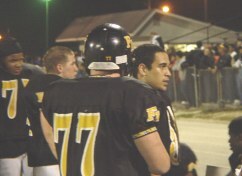 Fort Meade punted only once in the ball game. 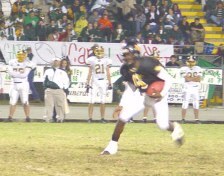 The Miners scored first with a little over 7 minutes left in the first quarter, this was a 5 play 6 yard touchdown run by tailback David Barfield capped off with a Flabio Valencia extra point. The only score of the night for Frostproof came with 6:07 of the 1st Quarter when WR Ike Knighten caught a pass on the Bulldog sideline and ran 93 yards for the score. The point after try was fumbled. 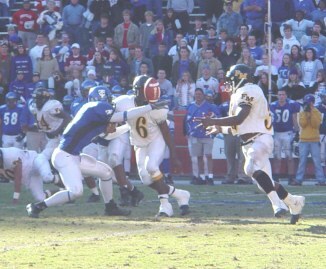 The "Lynch Mob's" bend but don't break defense allowed Frostproof very few opportunities to get in scoring position and quickly shut the door when the Bulldogs would threaten. 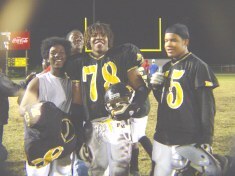 Fort Meade used some of their younger players in the game on defense. 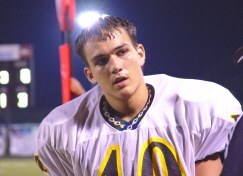 Charles White a standout from JV made some big time tackles. 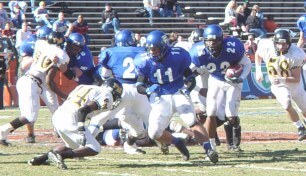 Sophomore Roderick Clark showed he was ready to step in at tailback if needed. 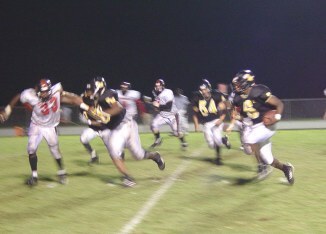 Clark finished the night with 55 yards on 3 carries. David Barfield had 95 yards rushing while Brian Whitehurst coming back for the first time since an injury sidelined him 2 weeks ago had 80 yards on 13 carries. 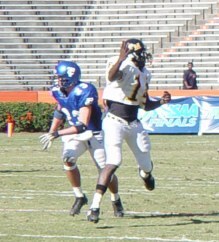 In the passing game QB Larry Freeman went 6of 7 for 117 yards connecting with 5 different receivers. 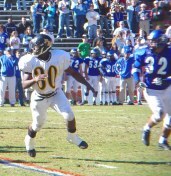 Franklin Brown and Anthony Johnson combined for 72 of the receiving yards. Defensively for the Miners Tony Huntley,Dakia Howard,Tony Price and Jonathan Pickens had big nights with Price and Andrew Smith recovering Bulldog fumbles. In all, this game was a great tune-up for the first round of the playoffs. 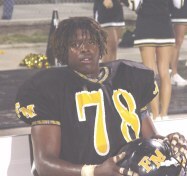 Fort Meade will be at home to face Admiral Farragut out of St.Petersburg(5-5). 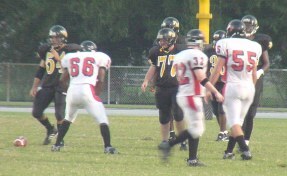 On the road for the second consecutive week the Fort Meade Miners found themselves down early in the ball game. But unlike last weeks 29-0 loss to Fort Pierce the Miners put their foot down and said enough is enough and went on to win the game 34-7. Moore Haven's lone score came early in the first quarter when the terriers Quarterback faked the option and sprinted 32 yards for the score. 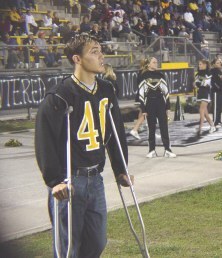 That would be the last time the "Lynch Mob" would allow Moore Haven to see the endzone. Miners Freshman Henry Grace #42 who moved up from the JV unit this week showing he could contribute to the success of the miner defense with two fumble recoveries one for a touchdown. 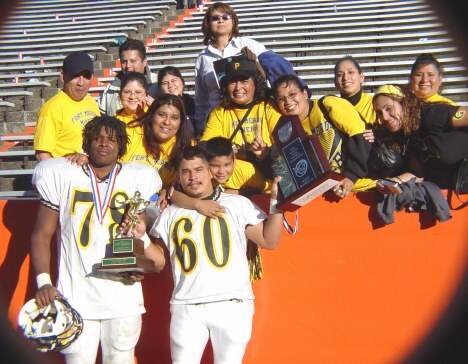 Other Miner defenders with outstanding performances were DT #78 Dakia Howard and pass rusher #5 Jesse Escobar . and Soph. 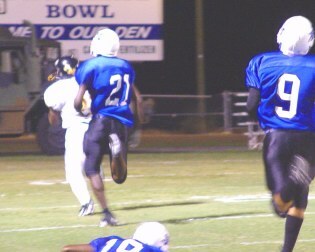 #2 Roderick Clark with (1 TD) that helped provide the spark the Miners needed to win the game. 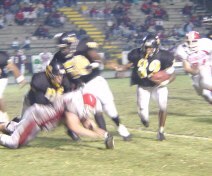 Quarterback Larry Freeman was held in check passing but not so much by the Moore Haven Defense as the high winds which caused the Miners to rely on their ground game. Freeman was able to complete 2 passes for 79 yards. Fort Meade ended the night with 224 yards of total offense and more importantly only 5 penalties for 35 yards. With the win the Miners improved their record to 7-2 with one regular season game to go. Next week the Miners will face arch rival Frostproof in a game which should be a real dog fight, but one that the Miners will be looking forward to. 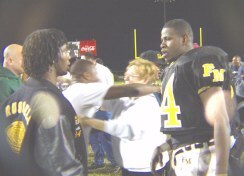 Fort Meade won it's 5th consecutive District title Friday night 29 to 13. 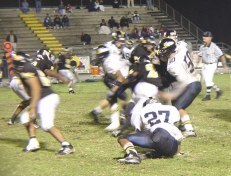 The game which at times seemed more like a "WWF Smack Down" than a football game, saw tempers flare early on both sides. Evangel Christian tried to use the smack talk approach with little success. The Chargers came out trying to intimidate Fort Meade, but the Miners showed how a championship team was suppose to act and just got the job done. 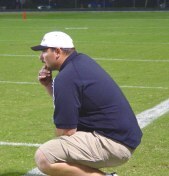 The Miners coaching staff did a great job preparing the team for the explosive rushing attack of the Chargers, who was held to their lowest rushing total of the year. The Lynch Mob Defense of the Miners did an excellent job containing running back Rod Coby, one of the counties leading rushers. The only 2 scores of the night for the chargers came in the 4th quarter, one of which was a result of a Fort Meade turnover inside the 10 yard line. The Miners offense worked the run game tonight, with 35 running plays to 12 passing. 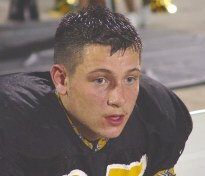 Fort Meade tailback Brian Whitehurst ended the night 12 carries for 99 yards and 2 TD's. 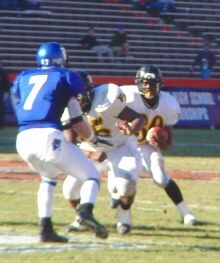 Quarterback Larry Freeman went 6 of 12 for 92 yards while rushing for another 51 yards and a score. The highlight of the night was a 90 yard touchdown run by Junior Tony Huntley who started left and reversed his field to race untouched down the Charger sideline for the score. The Miners just had to much speed for the visitors from Lakeland tonight. Congratulations Miners on a great victory and 5th District Title. 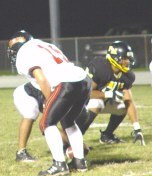 Next Week the Miners will be on the road to face yet another tough opponent from class 2B, Fort Pierce John Carroll. Miner fans be sure to make the trip to support your home town team as they try to go for another VICTORY! The 10ih ranked Miners of Fort Meade improved their record to 4-1 with a hard fought 6-0 victory over Clearwater Central Catholic. 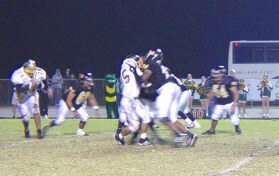 In a game with two high powered offenses, it would be the Miner defense which would make the difference in the game. Out sized the "Lynch Mob" Defense under the coordination of Coach King used speed and determination to wear down the Marauders . The only scoring opportunity of the night for Clearwater Central Catholic would come with 3:51 remaining in the 4th quarter on a failed field goal attempt of 36 yards. 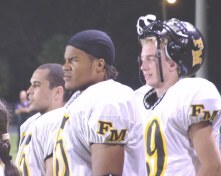 Fort Meade would take over from their own 20 and go on a 10 play 80 yard drive capped of by a 22 yard touchdown pass from quarterback Larry Freeman to wide receiver Franklin Brown with :56 seconds in the game. This was browns second TD of the evening, the first being nullified by a Miner penalty. 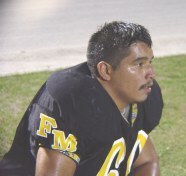 Fort Meade linebacker Tony Price sealed the victory for the Miners with an interception to end all hopes for the Marauders. Along with the outstanding play of Price on defense the secondary led by Junior Tony Huntley did a great job defending against a much taller group of receivers. 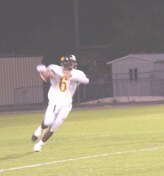 Quarterback Larry Freeman ended the night passing with 127 yards. 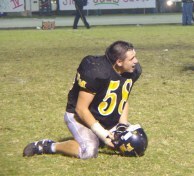 Running Back Brian Whitehurst had 55 hard earned yards on the ground. 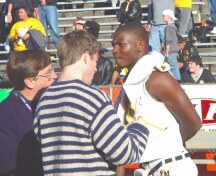 The leading receivers for the Miners were Tony Huntley 8 catches for 56 yards and Franklin Brown with 3 for 48 yards. Your Miners will be at home again this week to play for the District title against 5-1 Lakeland Evangel Christian. Be sure to come out to the Battlefield and cheer your Miners on to another District Crown. 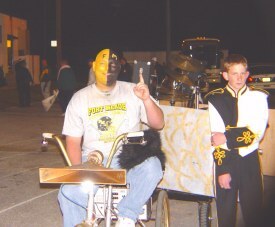 The Fort Meade Miners are one step closer to another post season appearance after downing district foe Lakeland Santa Fe Catholic 46 - 0 on Homecoming night at Frank S Battlefield. 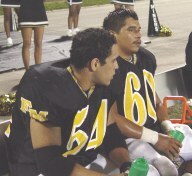 The Miners behind a stinging defense stopped the hawk's dead in their tracts allowing Santa Fe -17 total yards of offense. 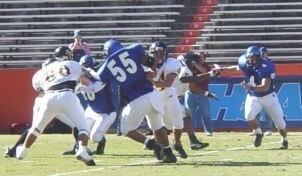 The games defensive standouts were defensive lineman Jonathan Pickens and linebacker David Barfield. Both of these individuals along with the rest of the "LYNCH MOB" kept Santa Fe Catholic from finding any offensive momentum in the ball game. 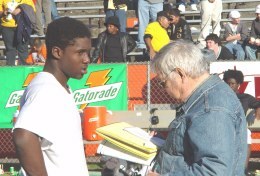 But it was the play of sophomore Roderick Clark on both sides of the ball which caught the eye's of Miner fans. 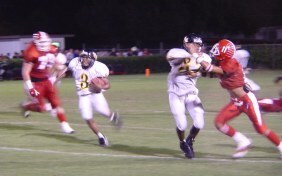 Clark recovered a fumble in the fourth quarter and on the next offensive play for the Miners took the handoff 58 yards for a touchdown on a play in which Clark emerged from a pile of would be tacklers to go the distance for the score . This was a case of a young player taking advantage of his opportunities. QB Larry Freeman who sat out most of the second half went 7/11 for 123 yards and 3 scores. Freeman connected with Senior Terrell Camp on a 27 yard pass for the Miners first score of the night. 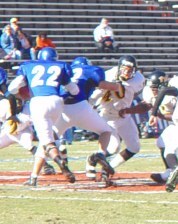 (camp would later score on a 8 yard run). Freeman found a wide open Anthony Johnson for a 65 yard TD catch and run before Junior Tony Huntley would end all first half points with a 12 yard TD catch. 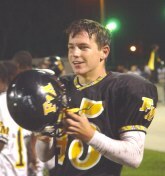 In the running game Fort Meade's work horse Brian Whitehurst had 5 carries for 62 yards and 1 TD. 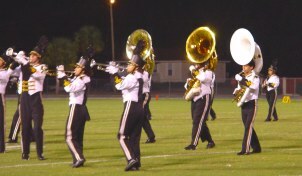 Fort Meade will play host to Clearwater Central Catholic this week. The Marauders come to town with a 4-1 record. This will be a tough test for our Miners. Miner fans need to come out in full force Friday night and cheer your team on to victory! Fort Meade came out refreshed and ready to play following their off week with a dominating performance to down the Mulberry Panthers 51 - 0. With the return of OT Dakia Howard to shore up the offensive line the Miners showed the type of offensive fire power which has led them to the playoffs the last 4 years. 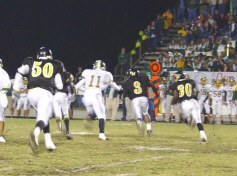 The over powered Panther Defense could do little to stop the miners as they moved up and down the field at will. Quarterback Larry Freeman had a career night passing, as he found multiple targets and finished the evening with 310 yards thru the air. 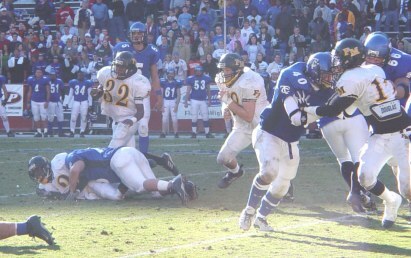 Running back Brian Whitehurst added 107 yards on the ground in only one half of play. 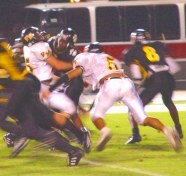 On the Defensive side of the ball the Fighting Miner Lynch Mob played as close to a perfect game as you could expect. 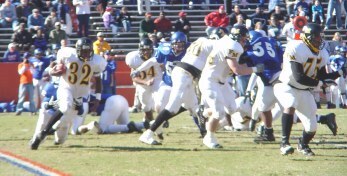 Mulberry which was only able to manage 103 yards of total offense found out early on that this defense of the Miners was not only fast but could hit like a freight train. 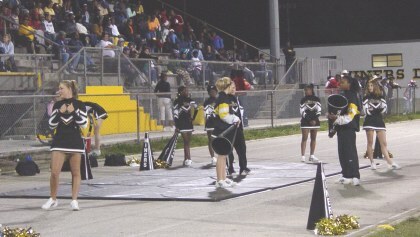 The "Lynch Mob" caused a total of 8 Panther turnovers in which Fort Meade converted into 5 touchdowns. 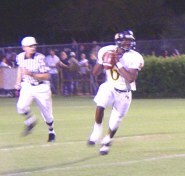 QB Larry Freeman accounted for 6 of the miners 8 touchdowns(5 passing and 1 running). The receivers ran perfect routes and made freeman's job a lot easier. 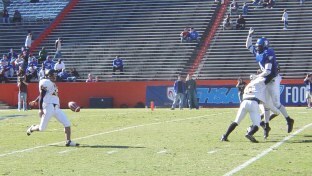 Miners place kicker went 3 for 6 on extra points with no field goal attempts. One of the highlights of the special teams was a 57 yard punt which pinned the panthers deep in their own territory. The only downside to the game was the amount of penalty's(17)on the miners. 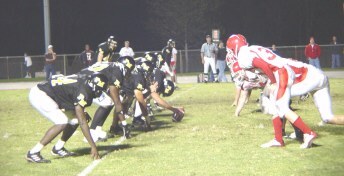 Fort Meade will be back in action next week in their first district match up vs Lakeland Santa Fe Catholic. Miner Fans "JUST BRING IT" the noise that is! 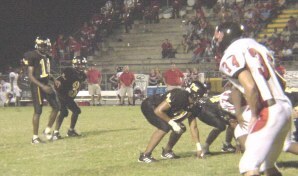 Fort Meade used a combination of running, passing and a stifling Defense to defeat the Haines City Hornets by a score of 20 to 7 in the 2003 Kickoff Classic. Fort Meade scored on it's second possession of the game when QB Larry Freeman aired out a 47 yard pass to wideout Tony Huntley with 9:51 in the first quarter. Freeman would end the night with 98 yards passing. The Miners scored once more in the first half on a long run by Brian Whitehurst. The second half would see a scoreless 3rd Quarter. 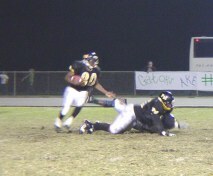 The miners would break the Hornets sprit and end all scoring when RB David Barfield scored from 4 yards out early in the 4th quarter. 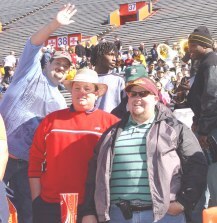 The Offensive line for the miners did a exceptional job providing protection for QB Larry Freeman as well as opening holes for the running game. 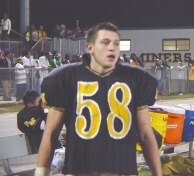 Brian Whitehurst led all miner rushers with 150 yards on the night. 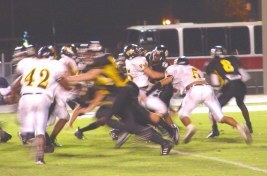 On the Defensive side of the ball, the miners used speed and grit to shut down the Hornet offense. The young miner Defensive backs showed the much larger Haines City team that they would have to earn everything, and nothing would be given to them. 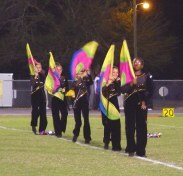 Fort Meade ended the night with 3 interceptions. 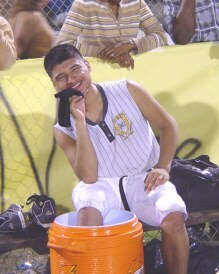 The only negative to the contest was the amount of penalties (12) the Miners received. 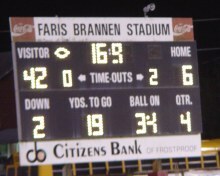 Great job Miners and now it's time to take it to them Wildcats from Hardee. See you next week at the Battlefield. As always "GO MINERS"